We’ve builded from today the first moderation Platform for MYETV; This Platform allows moderators to apply different restrictions to published contents and with this platform we are also testing the MYCOINS revenues, just for moderators and allowed personal. This is the first ever moderation Platform for different purposes and allows moderators to restrict and/or mark every contents published on MYETV; moderators cannot access to the content directly but they can search them, one by one, for the ID (or MYRC NUMBER) and without privacy rules and mark them with our restrictions system (https://blog.myetv.tv/2013/07/08/pegi-for-myetv-videos/) or mark them to an immediate control and/or deletion (they must have the right ID); moderators can also see in real-time anonymous report requests for contents from every users, so they can track every request maded by everyone. The Platform is still in testing and it is the most safe platform ever you must be logged in with an elevated right actived (alpha-testing ON and moderator grade) with CSRF tokens and a timespan intervall of 30 minutes for every request. Every successfull modeated content will make you earn mycoins in your account (depends on differents action taken earned mycoins could be 1[one] or 2[two]) and some reputation. 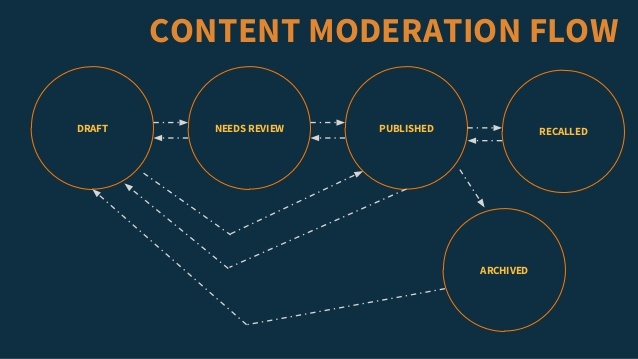 The owner of the moderated content will be blocked to edit the “restriction” options for that content and will be noticed in anonymous way; all the moderations are tracked and controlled, a content that is already successfull moderated cannot be moderated twice and if moderation is successfull the owner of the content cannot appeal to it and must accept the restriction for the good of the entire community. We’re also updating the Terms of Services to meet this requirements. This is the first Moderation Platform ever after a hard work lasted 4 years; also if we seen a lot of things we must keep the MYETV Platform safe and secure for every users. I strongly believe that for that purposes classification of the contents and education of the users is the right way. I hope you can enjoy MYETV in the best possible way. Thank you for your reading.